A lot of people love these BROWNIES because of their fresh creamy taste mixed in with the chocolate batter.They are beautifully marbled, black and white, and the textures make for a perfect bite. They will literally melt in your mouth. First heat the oven to 350°F. Prepare your baking tin – either greasing it with butter or lining it with grease-proof paper, if it’s a metallic tin. If it’s one of the new silicone ones, you won’t need to grease it at all, it will peel right off the Brownie once cooled. Heat the chocolate and butter over low heat, and mix thoroughly, then let cool while you prepare the cream cheese batter (by combining the Philadelphia cream cheese, the sugar, the vanilla extract and the egg). Then beat the sugar, eggs and vanilla extract with the melted chocolate/butter mixture on the high speed of your mixer for about a minute. Blend in the flour and salt and beat again, less vigorously, and finally fold in the nuts. Pour half the chocolate mixture into the cake tin and let it settle down into the corners.Spoon the cream cheese mixture over the chocolate layer, and then finish with the remaining chocolate mixture. 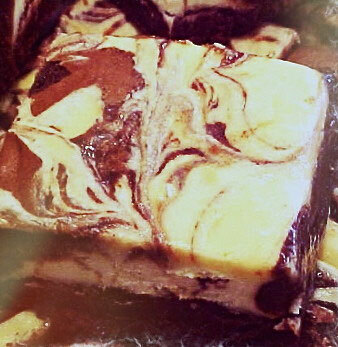 Using a toothpick or barbecue skewer, swirl the two batters together to make a marbled effect. Bake for 45 to 50 mins, or until a toothpick inserted in the center comes out clean and almost dry.Cool before trying to remove from the pan, then cut into squares and serve. M-Joy!